FORT MYERS, Fla.- Animals rights activists and Hendry County residents gathered at Centennial Park in downtown Fort Myers Sunday afternoon — to sing. WINK News exclusively revealed new information from Florida’s Captive Wildlife Division last week which show there are more than 2,600 monkeys currently held in Hendry County bred and sold for experimentation and biomedical research. WINK News spoke with monkey farm Primate Products CEO Jeffrey Rowell Sunday night. Rowell said demonstrators have a right to voice their opinions and that he is focused on his company’s mission of supporting biomedical research. 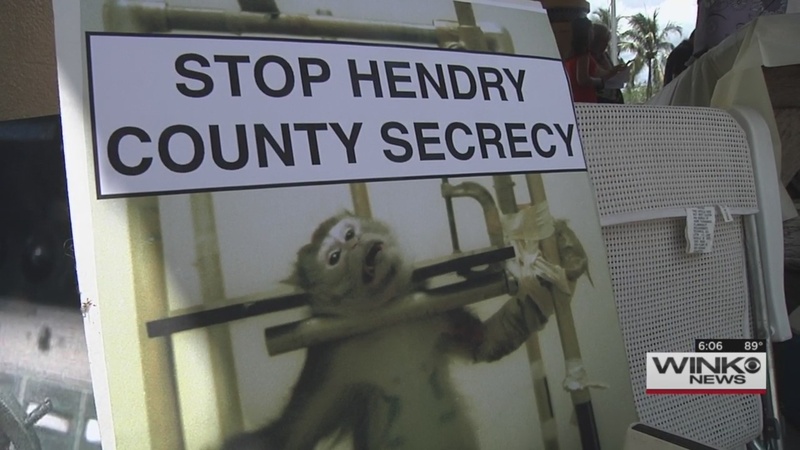 Primate Products and the Mannheimer Foundation’s Haman Ranch are both subjects of ongoing investigations by Hendry County code enforcement. They are both suspected of performing tests and experimentations on their monkey populations, operating outside of their current zoning. Code enforcement action came after a WINK News investigation revealed hundreds of monkey tests and experiments were reported to the USDA by both companies for several years.